If you’re working with minimal space in a bedroom and there’s not enough room for a desk, utilize a pull down headboard as a desk. 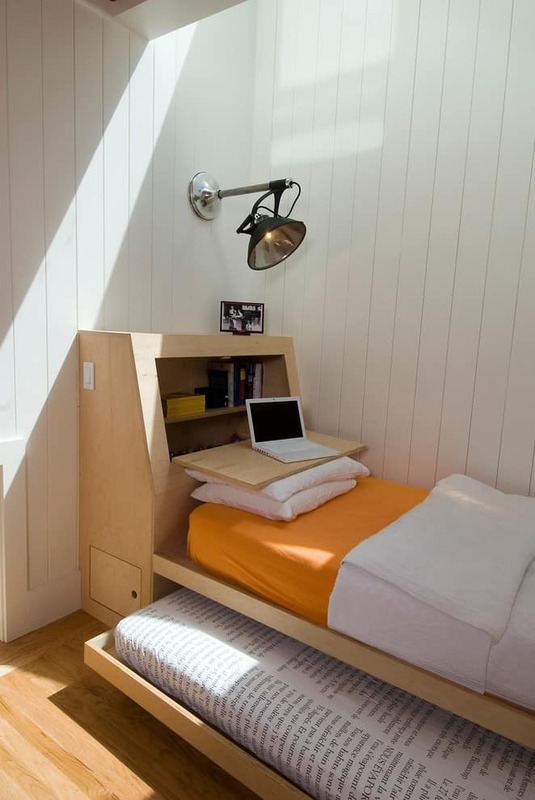 This is a perfect solution for teenage bedrooms, making it easy to transition from bed to study. A second mattress can also pullout from underneath too for any friends sleepovers sleeping over. We love the sneaky shelves for book storage inside the headboard as well. For kids sharing a room, give them more play space by building up. A play loft has been constructed over the beds like a secret treehouse for your kids to enjoy while providing additional room space. 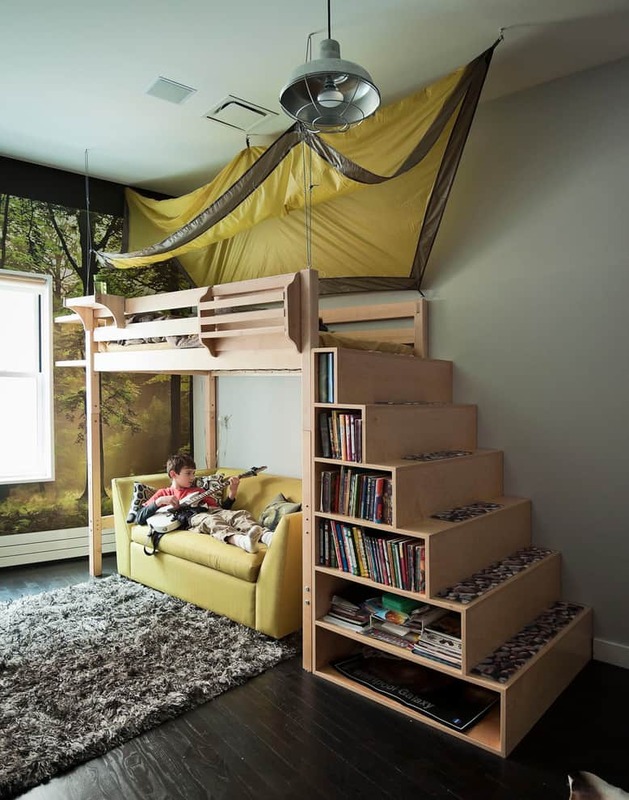 Kids love climbing, so a bed they can climb up to with a bonus canopy rooftop is a great opportunity for their fun and saving space. Use the steps for bookshelves and the area below the bed can easily serve as a play lounge or homework area with a desk. With a little creativity, this open concept bed structure is a win for everyone. For kids too old for play rooms, you can still adopt the build-up technique and use the extra space for an age appropriate alternative. 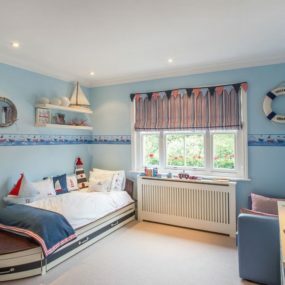 For example, this bedding structure allows a young pre-teen to store extra clothing in drawers under and beside the bed, put picture frames and special trinkets on shelving display, plus also serve as a cozy book nook by the window. 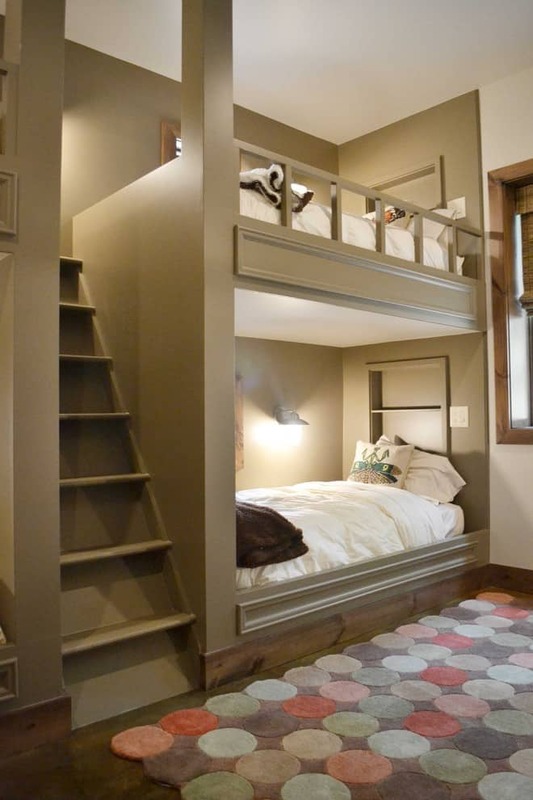 Another smart arrangement option for bunk beds is building them into the corner. This set up maximizes use of floor space. The bookshelf between the beds provides extra dimension and separation between sleepers, and illuminated cubbies at the head of each bed guarantees each kid a private nook. Under-bunk drawers allow each child to store some of their extra belongings and an electric plug can come in handy for alarm clocks and other electronics. 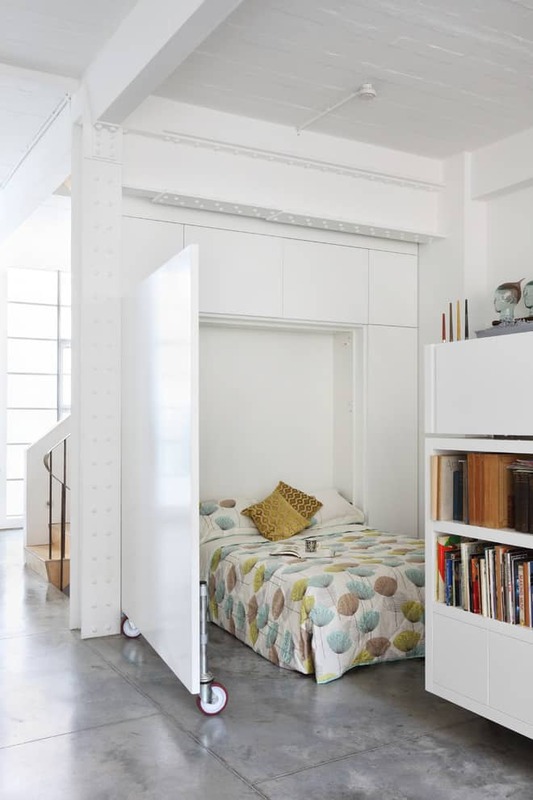 Maximize functional space for daytime in your bachelor flat with a hidden Murphy bed that pulls down from the wall. With this, you can still enjoy the comforts of a king size bed too! Notice the low back on the couch to make the pieces fit and flow together. A full wall of mirror-fronted storage also doubles the illusion of extra space in this trendy studio. Here’s another take on the Murphy bed that folds out of the way when not in use. 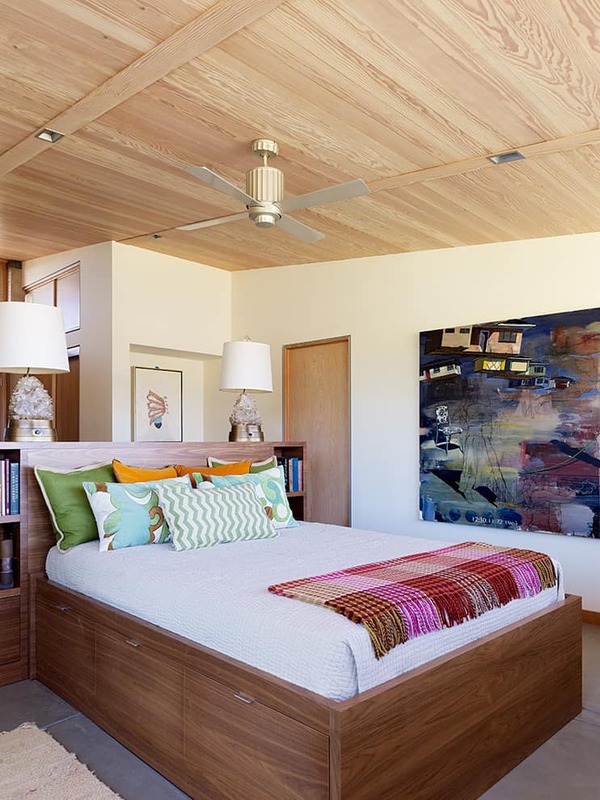 This loft-style bedroom easily transforms into a modern living room for your convenience. The blue metal door conceals the bed when folded up, but also creates a nice sense of privacy and boundary for sleeping. Save space again with the brilliant technique of building upwards. Building a wooden platform for your loft bed and custom storage drawers is a great option for small room apartments and lofts. Completely hide away a pulldown bed when room is tight and obliged to multi-task. We love how this one is concealed by a simple white door opening up the room, keeping that bright colour scheme, and making the bed truly disappear. This is a great option for offices turned guest rooms when the occasion rises. 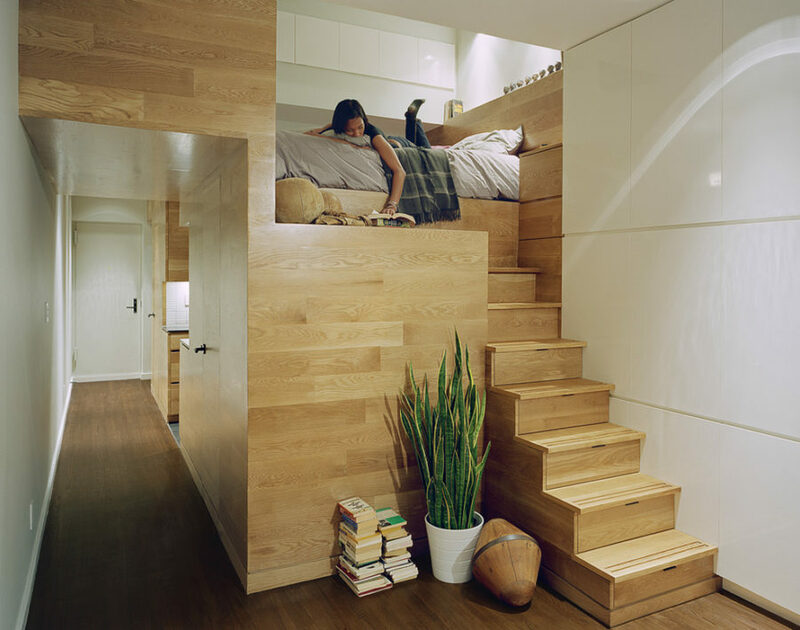 Here’s an ingenious idea for small size apartments! 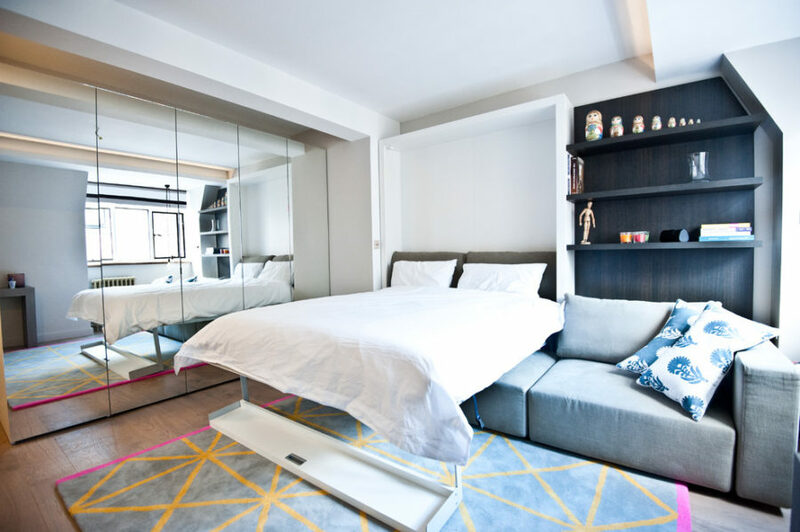 Create a bonus bedroom by building up from floor level like what’s been done here in this trendy loft-style studio in New York city. 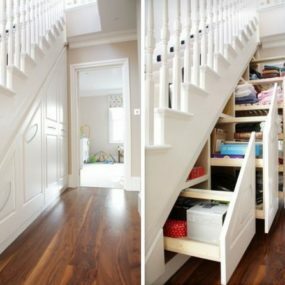 Bet you didn’t notice either that the steps actually double as drawers too! If you tend to have a lot of visitors often or a family cottage, transforming a guest room into a bunk room with more beds is a great idea. 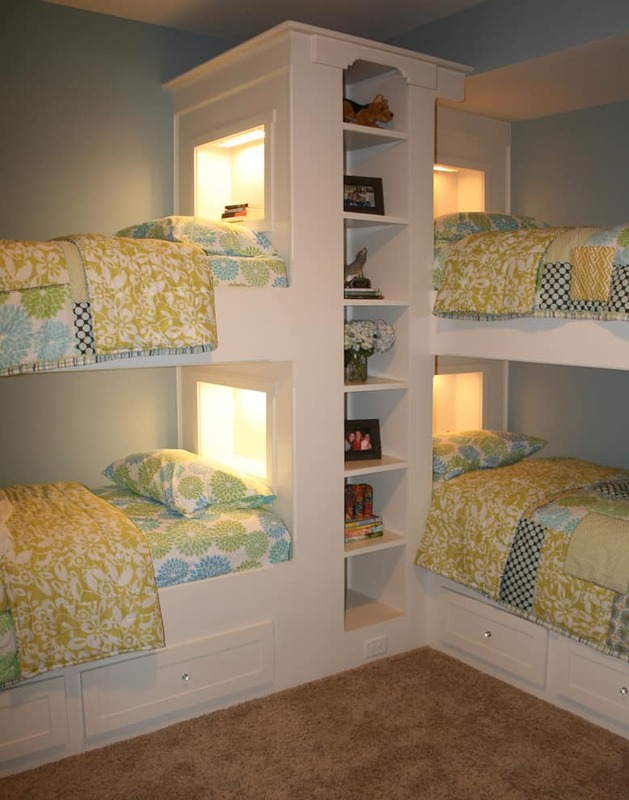 Two sets of bunks parallel to one wall will not only comfortably sleep four, but also leave space on the other side of the room for an extra wardrobe or desk. 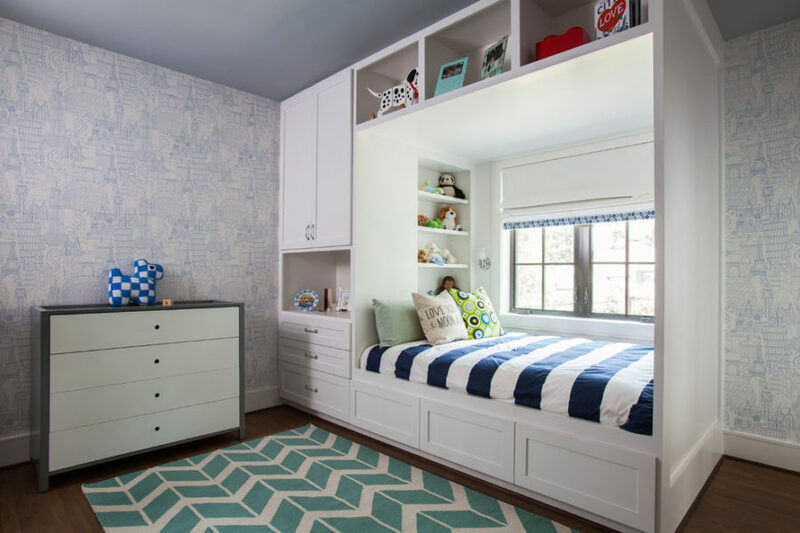 We love how this bunk room accentuates the nautical theme too with metal rails and stripes! 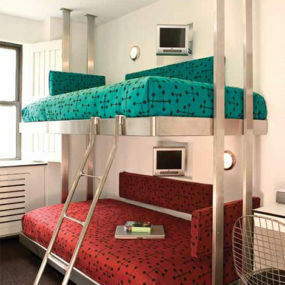 Bunk beds aren’t just for children! We love this custom grown-up version of the built-in bunk bed—a great solution for saving space in your guest room. For adult bunks, you’ll have to place the top bunk a bit higher for sleepers to be able to sit up straight and you’ll want to stick to a neutral colour palette when it comes to paint and textiles. Most of us like the idea of our master bedroom beds to be raised higher. Take advantage of this with a platform bed frame with storage drawers underneath and a built in headboard to a larger book shelf or wall console. 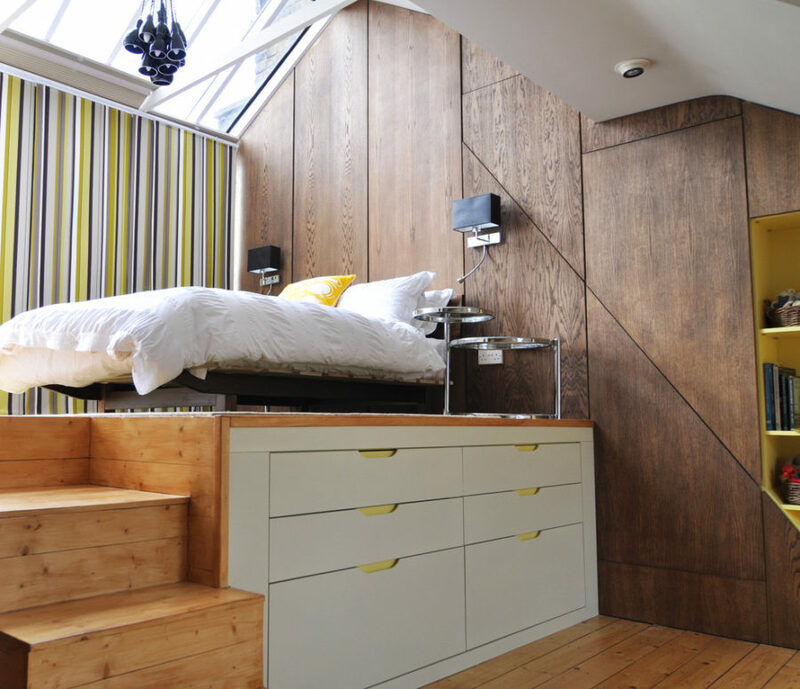 Here’s the ultimate modern solution to transforming a room and saving space. This bed actually drops down from the ceiling over top of this low back couch. We love this futuristic set up for a bachelor apartment. You can easily go from an open concept living space to modern master bedroom in seconds and you won’t even have to make your bed in the morning! 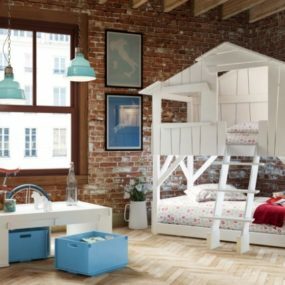 Kids Bedroom from Di Liddo & Perego that will please both children AND grown-ups!